Sleeping Beauty Stalker Comedy Film? This commercial--and program--has made quite a stir this summer. Mermaids: The Body Found: Mermaid Sightings Throughout History originally aired in Australia and premiered here in the US in May. I was aware of it from the commercials--my husband adores Deadliest Catch and somehow I always walked in the room when a commercial for this was airing. It is very spooky, very convincing even in the commercial and I, of course, thought of Orson Wells and his War of the Worlds in passing and then didn't think much about it all due to life's demands. Mermaids, alas, haven't been high on my radar the last several months. However, they loomed large in my brain last summer when I released my Mermaid and Other Water Spirit Tales From Around the World , so I have more than a passing interest all the same. The unsurprising result of a science fiction piece shot and shown like a documentary is that a small but vocal portion of viewers are convinced that mermaids are real and that government conspiracies have hidden the evidence a la Roswell. Mermaids — those half-human, half-fish sirens of the sea — are legendary sea creatures chronicled in maritime cultures since time immemorial. The ancient Greek epic poet Homer wrote of them in The Odyssey. In the ancient Far East, mermaids were the wives of powerful sea-dragons, and served as trusted messengers between their spouses and the emperors on land. The aboriginal people of Australia call mermaids yawkyawks – a name that may refer to their mesmerizing songs. Articles in the media have abounded from NPR to CNN to USAToday. It's fascinating to read and watch the hype. I'm not surprised. After all, I once knew a girl who was convinced dinosaurs were back after she saw Jurassic Park. Cleverly made film can spark our imaginations and convince us of things that fight our internal logic. After all of my mermaid research and studies a few years ago, I have to admit I am firmly convinced that mermaids do not exist in our reality. But they are magical, wondrous beings along with their many related iterations across cultures. And why are they so pervasive across those cultures? I don't have answers, only theories, but they boil down to our need for the magical, even the numinous, to explain things we cannot comprehend through our limited perceptions of our world. My book contains many articles about the history of mermaids from mythology to Victorian times which espouse a similar theory overall. I haven't seen the mocumentary yet but from my reading, it appears to pull many of the same stories, even imagery, to tell about the history of mermaid folklore. That is is presented as scientific theory disguised as fact is unfortunate for while it gets the sensation and press, it also weakens the integrity of the work as a whole for it appears to be a decent visual history of mermaid stories and theories. But then the makers probably don't care as they get to increase their bank accounts. You can see more clips of the Mermaids "event" at Animal Planet here. It doesn't appear to have a slated DVD release yet. Geek Charming, the movie from the Disney Channel, is based on Robin Palmer's novel of the same name. I mentioned it in today's other post, so I wanted to share the trailer here since I failed to discover it last year. (Despite all efforts, I miss so much here!) And, yes, it is inspired by the Frog Prince. The book is also bargain priced right now in paperback, so if these type of retellings are some of your favorites, don't miss this one! Dylan Shoenfield is the princess of L.A.'s posh Castle Heights High. She has the coolest boyfriend, the most popular friends, and a brand-new "it" bag that everyone covets. But when she accidentally tosses her bag into a fountain, this princess comes face-to-face with her own personal frog: self-professed film geek Josh Rosen. In return for rescuing Dylan's bag, Josh convinces Dylan to let him film her for his documentary on high school popularity. Reluctantly, Dylan lets F-list Josh into her A-list world, and is shocked to realize that sometimes nerds can be pretty cool. But when Dylan's so-called prince charming of a boyfriend dumps her flat, her life - and her social status - comes to a crashing halt. Can Dylan - with Josh's help - pull the pieces together to create her own happily-ever-after? Wicked Jealous: A Love Story by Robin Palmer was released earlier this month. Her original trilogy of fairy tale inspired YA novels were published a few years ago. One of them, Geek Charming, is even bargain priced in paperback right now. And it was made into a TV movie. I haven't heard if Palmer's been contracted for more titles in this world but these are fun and remind me of the trend in the previous decade for contemporary rather than high fantasy fairy tale retellings in Hollywood. A fresh and funny twist on Snow White from the author of Cindy Ella and Geek Charming! Simone never saw herself as the "cute girl"--she was always the chunky smartmouth. But after a year of avoiding her wicked almost-stepmonster through Zumba class, Simone's now sporting a whole new retro style. And people keep acting oddly. One thing: her stepmonster seems to be trying to accidentally kill her, or at least fatten her back up. And so when Simone's brother offers to let her move in with him and his six roommates for the summer, Simone jumps at the chance for some normalcy. Only living with seven very different college boys isn't exactly going to help her land her very own happily ever after . . . I think most of you regular readers are aware of my nail polish mini-obsession. I say mini only because nothing compares to my fairy tale and folklore and reading obsessions. 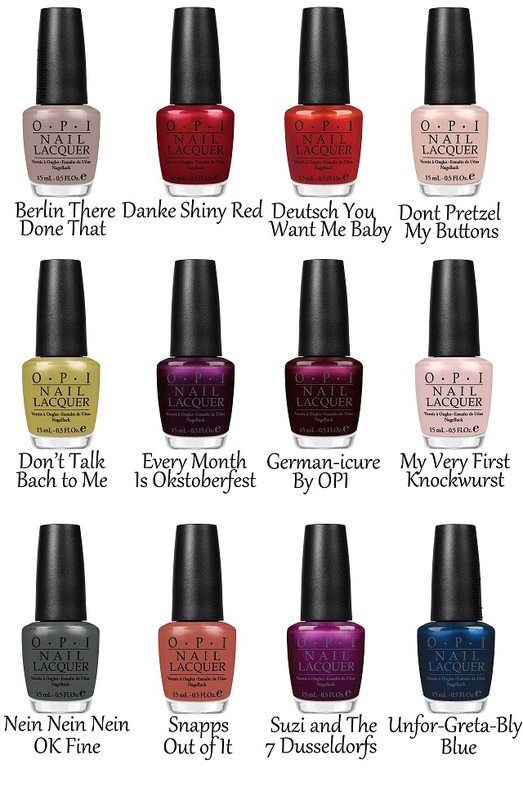 OPI Nail Lacquers usually offer at least one collection each year inspired by a country. They have just announced that the 2012 Fall Collection is inspired by Germany. Germany? 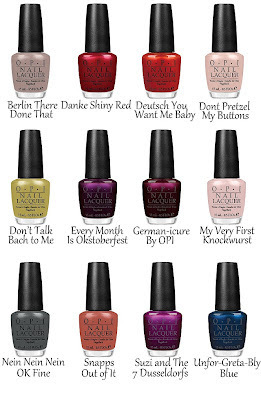 Yes, I, too, wondered if any of the colors would have fairy tale inspired names and fortunately OPI didn't fail me. One of the nail polishes is Suzi & the 7 Düsseldorfs (The most beautiful bright purple of all.) according to the press release. How fitting with this year being so Snow White heavy as well as the 200 year Grimms Anniversary. Suzi, by the way, is OPI's founder and her name often appears in an OPI collection. Here is another temporary ebook price drop: Anansi Boys by Neil Gaiman is currently $3.99. UPDATE: The price is only good this weekend, so expect it to rise again Sunday night. The Queen Bee by The Brothers Grimm (Author), Iassen Ghiuselev (Illustrator) has one bargain priced hardcover copy available on Amazon for $6.78. The little known fairy tale was inspiration for a Grimm episode in season 1--BeeWare [HD] , if I remember correctly. Anyway, it's there and an interesting addition to a fairy tale picture book collection--I've added it to mine! I will be back to regular posting soon. I had started to regain momentum again and then more demands got in the way! This one made the rounds of news sites and blogs last week. But I needed to share here, too, for archiving if nothing else! Interesting concept but I am always wary of stalker comedy plots. But at least it's not another high fantasy--not that I mind those at all--but we don't want to just get those, do we? Wow. I missed this one back in January when the fundraising was taking place. Interesting concept. Although I'm not sold on the prosthetics. Makes it too literal and they are distracting. To our surprise and delight, yesterday's release of the trailer for The Brick House has enjoyed an immensely positive response! Just overnight, the trailer has gathered over 100,000 views on YouTube (pending the update of their delayed view counter). It made it to the number 9 spot on Reddit's front page and held it for hours, gathering tons of upvotes. It more than doubled our followers on Facebook and Twitter. It's been featured on hypervocal, Daily of the Day, Nosebleeds and theVIRALtrend just to name a few of the many blogs and news sites that are talking about it. The best part about all this? People are loving it! Apart from that, it's reached a series of industry professionals who have reached out to us with interest in taking it even further. This...is a good sign. This is just the trailer, and the reaction has been huge. We can only imagine what will happen once audiences get to see the entire film. Needless to say, this is super exciting for us and we can't wait to see just how far we can go with it. You can bet that we'll be keeping you updated every step of the way. For now, help us keep it moving. Share the trailer with everyone you can. Send it to places and people that we may not be connected with and who may not know about us. Let's make this HUGE. For TODAY ONLY, The Princess Bride: S. Morgenstern's Classic Tale of True Love and High Adventure by William Goldman is $1.99 in ebook format from Amazon and Barnes and Noble. Which reminds me that I haven't watched the movie nor read the book in a while. Of course, my tv time has been severely limited for months now, but this may be on my list when life normalizes again in the next month or so. (I hope!) Of course, this is one of those movies that I pretty much have memorized--I saw it the first time in the theatre when it was released--so it's not as common for me to watch it since I can pretty much do so in my head. And, of course, the book is great, too! The Goose Girl (Books of Bayern) by Shannon Hale is marked down to $1.99 TODAY ONLY on Amazon and Barnes and Noble. Highly recommended, of course. And her The Book of a Thousand Days is still 99 cents--probably until her new Princess Academy book is released in a few weeks: Princess Academy: Palace of Stone . Thousand Days is my personal favorite by Hale. The Land of Stories: The Wishing Spell by Chris Colfer was released this week. Chris Colfer is a Golden Globe-winning actor best known for his role as "Kurt Hummel" on Glee. He was recently honored as a member of the 2011 TIME 100, Time Magazine's annual list of the one hundred most influential people in the world. The Land of Stories is his first novel. I haven't read this yet--and, no, the Glee bit doesn't recommend the book to me but I'm also not going to prejudge based on that, either. Snow White and Sleeping Beauty are up there on the cover along with a wolf and frog, so the promise of fairy tales appears to be upheld either way. Looks like this will be a series if it is successful enough and I'm sure it will be. I need your help. I am trying to come up with five fun/quirky/informational questions to give to authors who want to appear on the SurLaLune Blog. 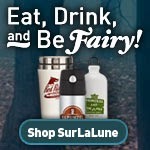 Blog tours are popular now and I want to make SurLaLune a welcoming spot for authors who use fairy tales for their inspiration. I often don't have time to read the book or think up snazzy questions to ask but authors like some direction from me since they are often overwhelmed, too. So my brain is tired and I find I am not very clever. And, anyway, you readers should have some input. So help me come up with five questions you'd love to see answered by the authors featured here on SurLaLune. I also fear asking questions that are too demanding of authors with a lot on their plates--believe me I get quite a few of those myself and simply cannot answer them due to my own limited bandwidth. So questions that can have both short or long answers are also desirable. What is your least favorite fairy tale? What is your favorite fairy tale hero/heroine to love or hate? What is your favorite fairy tale villain to love or hate? Besides your own, what is one of your favorite fairy tale retellings? So in the comments offer some questions, limit five, vote for others or offer your own. The latest issue (quite delayed for a while, but now out) of Faerie Magazine is on newsstands and features an article by me about Bluebeard, adapted from my introduction to Bluebeard Tales From Around the World (Surlalune Fairy Tale Series) . Due to editor Kim Cross's personal life, the next issue may be delayed for a little while, too, but I don't want you to miss this one if you are interested! I've seen it at Barnes & Noble in California and Tennessee so I know it is out there for you to find, too. Or you can order it online, too. Since I want to help get the word out...and I know Kim Cross well since I write articles for Faerie Magazine myself. Although I have my own Mermaid and Other Water Spirit Tales From Around the World , I didn't contribute anything to this particular publication. For a limited time, pre-order Brave (Five-Disc Ultimate Collector's Edition: Blu-ray 3D / Blu-ray / DVD + Digital Copy) to save $8. Coupon expires on July 19, 2012. There is a coupon on clip on the item page. The price drops to $26.99 which is a fine price for this edition. The deal ends tomorrow so be quick if you want it. While I didn't adore the movie myself, I liked it enough to own it and prefer it over several other choices for viewing with the littler ones in my life. My 7 year old nephew and 9 year old niece both enjoyed it when we saw it together in the theatre. And despite some of the flaws, many of my mother friends have loved that it is a story about a mother/daughter relationship more than anything else. And those were the best parts of the the film. Along with all of that unruly hair that is so talked about. We'll just not discuss the implication that Merida doesn't have to take on any adult responsibility of ruling or otherwise but gets an uninhibited freedom to play at the end in addition to a respect for her mother (which of course the mothers liked and should). But the coming of age message fell flat, rather making her a female Peter Pan. Calls for a sequel, no? LARB's YAC Lit publishes the first installment of Fairy Tales Revisited, a close look at a classic fairy tale, then and now. Today, Marie Rutkoski investigates symbolism and nature in the Cinderella tales of yore, and later in the week, Sarah Beth Durst, Deborah J. Ross, and Sarah Skilton review modern retellings. The first article is The Nature of Cinderella by Marie Rutkoski and I enjoyed it. Oh, we are getting some thoughtful articles about fairy tales in the media these days. Love! I haven't had time to consider and record my thoughts on this article, so it is time to simply share since the days are passing. I am blockquoting a larger portion than usual, but I'd love to have your thoughts! As I read this, I suddenly realized I am drawn to the Grimms' Cinderella over Perrault's due to the more natural elements. I prefer the tree on the grave although I adore fairy godmothers as a rule. This emphasis on nature may be due in part to a focus on transformation. Margaret Atwood, considering the influence of fairy tales on her writing, asked, “Where else could I have gotten the idea, so early in life, that words can change you?” Fairy tales are rife with transformation — from beast to handsome prince, from dirty scullery maid to well-dressed princess. It is perhaps no coincidence that nature in the Cinderella stories facilitates transformation, for nature itself is a changeable thing, from season to season, from a sunny day to rain, from an egg to a flying bird in a matter of weeks. In the Cinderella stories it seems that nature serves an even greater role: as a source of power. While some Cinderellas are more in charge of their destiny than others, many of them get what they want by simply asking nature to provide. Marissa Meyer, when writing Cinder, went to great lengths to reverse this paradigm, and render her version of Grimm’s tale unnatural. The result is that her cyborg Cinderella possesses greater independence and power. In an email interview, Meyer said, “My main character's greatest assets (in my opinion) are her intelligence and resourcefulness, as shown by her ability to fix broken machinery and technology.” Manipulation of technology, the creation of energy out of inert objects, is indeed different from calling on the powers of nature. In Cinderella stories, nature often functions in the place a fairy godmother, a figure we have come to think of as almost requisite to fairy tales. Although “Donkeyskin” does feature a fairy godmother, (one who is somewhat inept, and dispenses questionable advice on how the princess might escape her father’s lust), this character is largely absent from most versions of the tale. Instead, nature steps in, either in the form of fish bones in “Yeh-hsien,” or the hazel tree and birds in Grimm’s version. This parallelism between nature and the fairy godmother takes on intriguing significance when we consider the etymology of the word “fairy.” It comes from the Anglo-Saxon “fegan,” meaning to join or bind. “Fegan” suggests a sense of compulsion, and in most older versions of Cinderella, we can see how nature aptly fits these meanings, compelling the story toward its narrative end of a very particular kind of binding: the union of marriage. The effect, I think, is to make nature seem to be in collusion with love. One message in some versions of the tale, particularly Grimm’s, is that love is like a force of nature, and nature will take its revenge on those who stand in its way. Many of the various cruel stepmothers and stepsisters meet violent ends. While Lin Lan’s ugly stepsister Pock Face is boiled in oil due to her own choice, in several tales her counterpart is punished by animals. The stepmother and stepsisters are pulled apart by wild horses in a Filipino version, and in the Grimm’s tale, birds pluck out the stepsisters’ eyes. Such punishments, of course, are doled out in order to give readers the satisfaction of revenge without casting the protagonist in a negative light. Cinderella doesn’t blind her sisters; the birds do. The princess can have her happily ever after with no shade of guilt. Similar strategies are at work in other fairy tales. In Grimm’s “Snow White,” for example, the wicked stepmother is invited to the wedding dinner, and while she does not want to go, feels oddly compelled. Iron slippers heated over coals await her: “she had to put on the red hot iron shoes and dance in them until she dropped to the ground dead.” Interestingly, no one seems responsible for this punishment. In the original German, the tale’s end is carefully ambiguous. Snow White doesn’t make the stepmother go to the feast or put on the slippers — no one does. It simply happens, much in the way that someone standing in the full force of a hurricane’s gale will be pushed by the wind. Once Upon a Time: The lure of the fairy tale by Joan Acocella is a new article at The New Yorker--dated for 7/23/2012 but appearing today online. The article is lengthy and mostly draws from the works of Jack Zipes and Maria Tatar as well as some of the usual books recommended over and over here on SurLaLune. I'm adding images (with links) to this post here for easier reference. Much of what is discussed in the article will not be new to those who have read much fairy tale scholarship, but the article is an excellent overview of theories and sources. And so you could say that the Grimm tales are no different from other art. They merely concretize and then expand our experience of life. The main reason that Zipes likes fairy tales, it seems, is that they provide hope: they tell us that we can create a more just world. The reason that most people value fairy tales, I would say, is that they do not detain us with hope but simply validate what is. Even people who have never known hunger, let alone a murderous stepmother, still have a sense—from dreams, from books, from news broadcasts—of utter blackness, the erasure of safety and comfort and trust. Fairy tales tell us that such knowledge, or fear, is not fantastic but realistic. Maybe, after this life, we will go to Heaven, as the two little girls who starved to death hoped to. Or maybe not. Though Wilhelm tried to Christianize the tales, they still invoke nature, more than God, as life’s driving force, and nature is not kind. Seen these yet? Verizon, Disney and fairy tales. Oh my! I prefer the Evil Queen one myself--the humor works better for me. And the commercials rely on some knowledge the fairy tales they are referencing. Tree Shepherd's Daughter (Faire Folk, Book 1) (Faire Folk Trilogy) by Gillian Summers is really bargain priced today--it's free! + Captain Hook is coming! + We will find out the identity of Henry’s father — and Jennifer Morrison knows who it is! “We talked about it early on,” she said. Kitsis’ tease? “I think Goofy is probably going to be Henry’s father,” he joked. “We gotta give Emma more credit here,” Morrison retorted. + We will learn the mythical identity of Dr. Whale this season. + There’s room for Kristin Bauer van Straten to return as Maleficent! “I didn’t see her body,” said Horowitz. + We will find out what happened to Mr. Gold’s son Bae this season. Who will we meet at the beginning of the episodes come fall? Well, in addition to the purple smoke monster, there were Mulan, Sleeping Beauty and Jack and the Bean Stalk, to name a few. Although fall seems so far away, rest assured that it won't be too long until the new characters are introduced. "Very early in the season we're going to start to see some of these people join our group," says Horowitz. But the new guys won't take the focus away from the core group. "You are going to meet these people through our characters," says Kitsis. Bonus: Dr. Whale gets a fairytale counterpart. We'll also meet Henry's father, who may or may not be someone we've seen before. "It might be Sneezy," says Kitsis, who jokes that maybe it's not significant anyway. "His name's Jeff. He lives in a suburb outside of Chicago. It's not a big deal. It was a one-time thing." One person who does know: Jennifer Morrison. "I think Goofy is probably going to be Henry's father," Kitsis says later on. "You've got to give Emma some more credit here, geez! I just feel like she's got some taste," Morrison replies. Did you realize Grimm: Season One comes out on DVD in less than a month, on August 7th? Since the show is returning early, so is the DVD set. And on that note, here's some bits from articles about Grimm's appearance at Comic Con. Obvious fan favorite: If it wasn’t already clear on various message boards over the past season, it was definitely evident in the room that Mitchell’s portrayal of Monroe has quite the fan club. He got the biggest cheers when he appeared on the season 1 recap video screened at the beginning of the event and when he was introduced on the panel. With his fiancée, Julie (Bitsie Tulloch), in a coma, his partner, Hank (Russell Hornsby), not far from a breakdown and his thought-to-be-dead mother suddenly very much alive, Nick's life promises to get even more complicated on the second season of NBC's Grimm (Aug. 13, 10 p.m. ET/PT). "The Grimms were early profilers," executive producer David Greenwalt told a Comic-Con audience Saturday. "The people who wrote these stories could see these people." Viewers will also learn more about Nick's superior, Capt. Renard (Sasha Roiz), and where he fits in a world of Grimms, Wesen and ordinary people. Roiz, however, wasn't giving any details away. "I'm just Capt. Renard." As is the case with many shows with deep mythologies, fans who have been burned in the past by other shows wanted promises that Grimm would resolve all its mysteries during the course of its run. "I'll make sure that happens," executive producer Sean Hayes said.